Assigned status Up to Date by Cat Nguyen Burkat, MD FACS on May 7, 2017. Patient with metastatic breast carcinoma to the orbit demonstrating proptosis, chemosis, severe exposure keratopathy, and eyelid swelling. Of all metastatic tumors to the orbit, breast carcinoma is considered to be the most prevalent primary tumor, accounting for 29% to 70% of all metastases. The mean interval from diagnosis of primary breast carcinoma to detection of orbital metastasis ranges from 4.5 to 6.5 years. Ocular metastasis can represent the initial manifestation of breast carcinoma, with up to 26% of orbital breast metastases presenting before the discovery of the primary tumor. In contrast to other orbital metastases, breast carcinoma can have a bilateral presentation in up to 15-20% of cases. Although breast carcinoma primarily affects women, the risk in men is approximately 1%. In most cases of metastases to the orbit, there is a previous history of breast cancer that has been previously treated or the patient presents with an orbital mass in the setting of active malignancy affecting multiple organ systems. The histology features of adenocarcinoma of the breast vary, and the histologic features of orbital metastases may differ from that of the primary tumor. All metastatic breast carcinoma is considered invasive. Types of invasive breast carcinoma include ductal, lobular, and mixed. To date, the basis for breast carcinoma as the most common primary metastatic process to the orbit is unclear. Given the lack of lymphatics in the orbit, hematogenous spread is required for the development of metastasis. Orbital breast metastases tend to preferentially localize within orbital fat or extraocular muscles. Scirrhous infiltration of the orbit can also occur, resulting in enophthalmos. Approximately 10% of patients with breast carcinoma metastatic to the orbit present with enophthalmos. The diagnosis of metastasis to the orbit is suggested by clinical history, ophthalmological examination, and imaging studies, and is confirmed by biopsy. Orbital imaging with CT or MRI is helpful in guiding the biopsy in order to determine the appropriate surgical approach and to minimize injury to vital orbital structures. Almost all orbital metastases evaluated with MRI show some degree of enhancement with contrast agents. Breast carcinoma metastatic to the orbit tends to localize in the orbital muscle and fat (both intraconal and extraconal). Orbital metastases from breast cancer tend to be diffuse and irregular, often growing along the rectus muscles and fascial planes. When orbital bone is involved, metastatic breast carcinoma tends to be destructive in nature rather than hyperostotic. Computed tomography of a patient with orbital metastasis from breast cancer. Axial image demonstrating diffuse infiltration of the inferior rectus, orbital fat, and eyelid soft tissue without bony involvement. Mammography in the absence of prior history of neoplasm should also be considered. A history of a progressive course of symptoms with possible motor and sensory deficits is often elicited. A thorough medical history should be obtained for possible history of known breast cancer, or symptoms suggestive of systemic malignancy. A complete eye exam, including assessment of ocular motility, orbital palpation, and exophthalmometry, as well as palpation of regional lymph nodes, including axillary and supraclavicular lymph nodes, should be performed. Patient with metastatic breast carcinoma to the orbit with a diffuse left lower lid mass with ill-defined borders, firm and nontender to palpation. Orbital biopsy specimen from a patient with metastatic breast carcinoma to the orbit demonstrating cords and strands of neoplastic cells in a single file arrangement and focal ductular differentiation surrounded by areas of fibrotic stroma (hematoxylin-eosin, original magnification x200). The diagnosis is confirmed by obtaining an open orbital incisional biopsy and examining the histopathology. 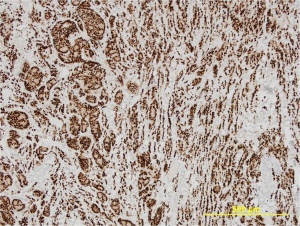 Immunohistochemical evaluation of the orbital biopsy specimen for estrogen and progesterone receptor and oncoprotein expression is important not only for diagnostic purposes but also in guiding treatment plans. The hormone receptor status in metastatic lesions may vary from that seen in the primary malignancy. Strong diffuse nuclear staining with antibodies for estrogen receptor is observed (original magnification x100). Laboratory studies to exclude the diagnosis of granulomatous, vasculitic, endocrine, and immunologic disorders are appropriate and may include: complete blood count with differential, antineutrophil cytoplasmic antibody (ANCA), erythrocyte sedimentation rate (ESR), C-reactive protein (CRP), thyroid profile, angiotensin-converting enzyme (ACE), lysozyme, antinuclear antibody (ANA), and quantitative immunoglobulins. Chest radiography to evaluate for hilar adenopathy associated with sarcoidosis may also be considered. Given that 54% of patients with orbital breast metastases present with infiltrative or inflammatory signs, metastatic breast carcinoma must be included in the differential diagnosis of inflammatory and infiltrative orbital processes encountered in adult female patients. Idiopathic orbital inflammation (IOI) - most commonly presents as a unilateral painful ophthalmopathy in adults, with sudden onset of progressive erythema, edema, and proptosis. Imaging typically demonstrates ill-defined orbital opacification. The extraocular muscle tendons of insertion may be thickened in up to 50% of patients. Myositis – is considered a subtype of IOI with a clinical presentation of acute orbital pain worsened by eye movements. Imaging studies demonstrate enlargement of the affected muscles that may involve the tendons of insertion. 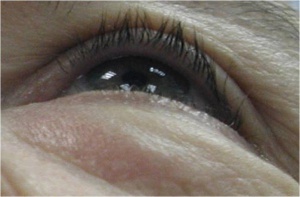 Thyroid-associated orbitopathy (TAO) – retraction of the eyelids with lateral flare, eyelid lag on downgaze, and dull deep orbital pain are features of TAO. The disease process is usually bilateral and thickening of the extraocular muscles without involvement of the associated tendons may be noted on orbital imaging. Orbital cellulitis – clinical findings include fever, leukocytosis (75% of cases), proptosis, and restricted ocular motility with pain on attempted eye movement. A preceding history of URI, sinus symptoms, or trauma could be consistent with orbital cellulitis, and imaging would commonly demonstrate sinus disease and possible subperiosteal abscess. Granulomatosis with polyangiitis (GPA; formerly known as Wegener's) – may involve the orbit, often bilaterally, usually by contiguous spread from the paranasal sinuses or nasopharynx. A history of renal, pulmonary, or sinonasal disease would be suggestive of GPA. Orbital lymphoma – usually associated with slow painless onset and progression. Lymphoma in the orbit may have an infiltrative pattern or discrete nodules, and it may involve any orbital soft tissue. A characteristic finding on orbital imaging is an irregular mass molding to the shape of the orbital bones or globe. Bone destruction is possible in aggressive lesions and HIV. Sarcoidosis – the lacrimal gland is the site most frequently affected within the orbit. Orbital soft tissue involvement is more common in patients older than 50 years and in women and may present as a slowly progressive, usually painless mass with possible exophthalmos and limitation of extraocular movements. 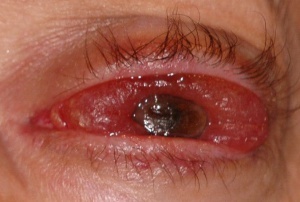 Posterior scleritis – may present with periorbital edema, chemosis, conjunctival injection, mild proptosis, and pain. Ultrasound is extremely useful in demonstrating increased scleral thickness and fluid in Tenon’s space. Orbital imaging may show a thickened posterior sclera. Endophthalmitis – may have an acute onset of pain and decreased vision in the context of trauma or recent intraocular surgery, with findings of hypopyon or vitritis on exam without proptosis or extraocular motility limitation. Risk factors for endogenous endophthalmitis including immunosuppression, indwelling venous catheters, and drug abuse should be assessed. Myasthenia gravis- symptoms of pupil-sparing ocular motility disorder and ptosis may invoke consideration for ocular myasthenia gravis. Ptosis that improves with rest or ice test is characteristic of myasthenia gravis, and may be confirmed with tensilon testing. Direct carotid-cavernous fistula – usually associated with head trauma, especially basal skull fracture. Findings on clinical exam include dilated corkscrew sclera/episcleral vessels, proptosis that may be pulsatile, and an orbital bruit that may be abolished by ipsilateral carotid compression in the neck. Imaging classically demonstrates prominence of the superior ophthalmic vein and diffuse enlargement of extraocular muscles. Indirect carotid-cavernous fistula – clinical features are more subtle than in a direct carotid-cavernous fistula, and may include insidious onset of mild epibulbar injection with or without chemosis, slight proptosis, and mild pain. Imaging often demonstrates diffuse enlargement of all the extraocular muscles resulting from venous engorgement and a characteristically enlarged superior ophthalmic vein. External beam radiotherapy to stabilize the orbital metastatic lesion is the mainstay therapy, and is usually administered to control tumor growth, preserve visual function in the short term, decrease proptosis and exposure keratopathy, or to improve patient comfort. Dramatic improvement in orbital symptoms, including recovery of vision when impairment is secondary to orbital mass effect, has been reported in many series. This treatment is usually delivered in several fractions with different fields of applications and globe protection with a shield to reduce complications. Exposure keratopathy secondary to orbital metastases may be managed with aggressive lubrication with artificial tears and ointment, with consideration for a temporary or permanent tarsorrhaphy in cases that fail conservative measures. Orbital surgery is primarily used for diagnostic rather than therapeutic purposes given that the disease is usually widespread at time of diagnosis and is not curative. Surgery may be used in palliative management of some patients in whom other treatments have failed. In selected cases, tumor resection, even if incomplete, may be appropriate to improve symptoms of pain, diplopia, and proptosis. The 5 year survival rate of patients with metastatic breast cancer is 21%. Mean survival time after diagnosis of orbital metastases from breast cancer is 22 months (range, 1-116 months). ↑ 1.0 1.1 1.2 Shields JA, Shields CL, Brotman HK, et al. Cancer metastatic to the orbit: the 2000 Robert M. Curts Lecture. Ophthal Plast Reconst Surg. 2000;17:346-354. ↑ 2.0 2.1 2.2 2.3 2.4 2.5 2.6 Ahmad SM, Esmaeli B. Metastatic tumors of the orbit and ocular adnexa.Curr Opin Ophthalmol. 2007;18:405-413. ↑ Goldberg RA, Rootman J, Cline RA. Tumors metastatic to the orbit: a changing picture. Surv Ophthalmol. 1990;35:1-24. ↑ 4.0 4.1 Giordano SH, Buzdar AU, Hortobagyi GN. Breast cancer in men. Ann Intern Med. 2002;137:678-687. ↑ 5.0 5.1 Toller K, Gigantelli J, Spalding J. 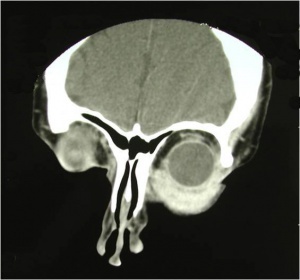 Bilateral orbital metastases from breast carcinoma: a case of false pseudotumor. Ophthalmology. 1998;105:1897-1901. ↑ Garrity JA, Henderson JW, Cameron JD. 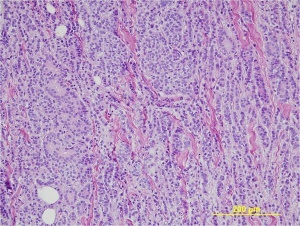 Metastatic carcinomas. In: Henderson’s orbital tumors. 4th ed. New York: Raven Press; 2007; pp. 313-326. ↑ 7.0 7.1 Guthoff RF, Katowitz JA. Evaluation and management of metastatic orbital tumors. In: Oculoplastics and orbit: aesthetic and functional oculofacial plastic problem solving in the 21st century. 1st ed. New York: Springer; 2009; pp 178-181. ↑ 8.0 8.1 Valenzuela AA, Fleming B, Ong L et al. Orbital metastasis: clinical features, management and outcome. Orbit. 2009;28:153-159. ↑ 9.0 9.1 9.2 Orbit, Eyelids, and Lacrimal System, Section 7. Basic and Clinical Science Course. San Francisco: American Academy of Ophthalmology, 2009. ↑ 10.0 10.1 10.2 10.3 10.4 10.5 Kanski J, Bowling B. Orbit. In: Clinical ophthalmology, a systematic approach. 7th ed. New York: Elsevier; 2011; pp 80-120. ↑ Wickremasinghe S, Dansingani K, Tranos P, et al. Ocular presentations of breast cancer. Acta Ophthalmol Scand. 2007;85:133-142. ↑ Dieing A, Schulz CO, Schmid P, et al. Orbital metastases in breast cancer: report of two cases and review of the literature. J Cancer Res Clin Oncol. 2004;130:745-748. ↑ Ratanatharathorn V, Powers WE, Grimm J, et al. Eye metastasis from carcinoma of the breast: diagnosis, radiation treatment and results. Cancer Treat Rev. 1991;18:261-276. This page was last modified on June 27, 2018, at 15:54.